Yong Tau Foo! Minced fish stuffed items. Yep. Fish alright. Fish minced or fish paste filled in various vegetables. Thereafter, frying of the stuffed veggies ((Fried Shrimp Wantons), followed by drenching in a broth or soup (Chick Kut Teh, Chicken Wanton Soup & Chinese Vegetarian Noodle Soup) made from fish bones and skin, and accompanied by chilli dip. Or instead of fish broth, you can also consider curry (Curry Mee). Choice is yours. This my version of Yong Tau Foo? Please. Do not compare with those from hawker stalls (Malaysian Fried Mee, Chap Chai, Penang Mee Yoke, Hokkien Mee & Chinese Fried Rice). You shouldn't in fact because I worked within my limitation of ingredients I had in hand, neither did I want buy any other. I basically didn't see a reason for spending for other ingredients. Why? What for? The smartness of cooking at home I believe should be keeping cost low. Wouldn't you agree? Spending is easy, saving is darn tough the call? So, do the little saving by always beginning with limiting the number of ingredients (Ikan Bilis Fried Rice, Char Kway Teow & Malaysian Sour Spicy Fish Soup Noodles) and as I have already said, start with what's already available at home. I'm done. Recipes is all yours now. Process/blend fish flesh with cornflour, salt and pepper for a thick smooth paste. Keep aside to be stuffed into the veggies. Slit chillies and brinjal in the center (don't split till the end, just a pocket to stuff the fish paste). Remove seeds from the chillies and also from bitter gourd. Stuff/fill all these pieces with the fish paste, just enough. Heat oil and fry the pieces, to cook and for a nice crispy layer on top. Simmer fish bones and skin with 1/2 liter of water to extract broth. Drain and pour back in the pot. Blend or process chillies and garlic. Mix and stir with vinegar, sugar and salt. Add fried pieces in a serving bowl. Pour piping hot soup over. Garnish with garnish with coriander leaves and spring onion. Serve with the chilli garlic dip. Wow Yong tau fu .. U know how to make it? Is just a simple dish... My aunt use to make it when I was younger..
First I was surprised to see that many chillies in a single bowl of soup. Then I read that you have stuffed with fish paste. 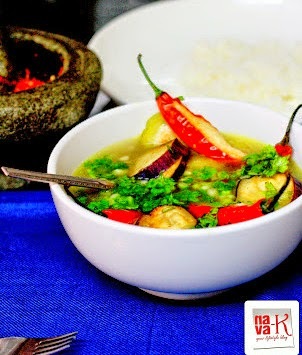 what a gorgeous soup with vegetables in fish broth. 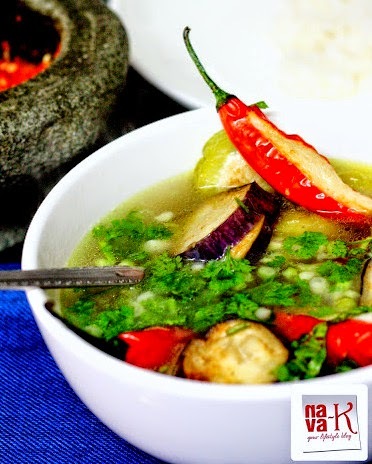 i love brinjal yong tau fu :) easy to prepare and simply delicious! Latest: How Hot can You Stand? hi nava, wow! i must learn to make this also. it's very healthy, wanna learn how to use the fish bones from you. the fish bone is a great source of calcium for our bones... i read somewhere that calcium from milk alone is not enough for our bones.. Thanks to all for the comments. We enjoyed it very much though I must say I had to spent much time in the kitchen to bring out this dish.